The U-Box(UB) is designed as a low cost, USB powered data logger, and an industrial embedded controller. It integrates 16-bit ADCs, 24-bit ADCs, 16-bit DACs, CompactFlash and a High Speed USB port. 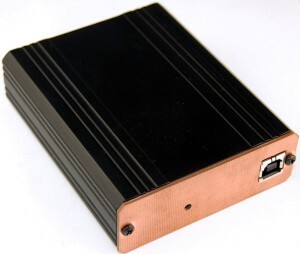 Boxed in an extruded aluminum enclosure of 4.0×3.2 inches, the U-Box(UB) is designed as a low cost, USB powered data logger. 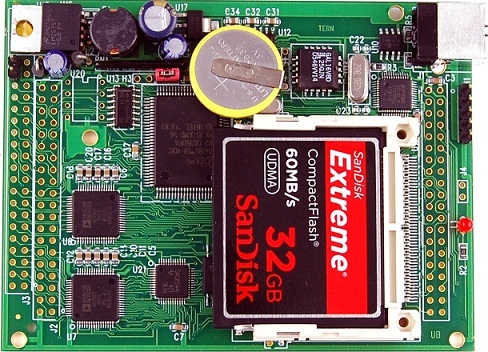 It integrates 16-bit ADCs, 24-bit ADCs, 16-bit DACs, CompactFlash and a High Speed USB Port. The UB is based on a high performance C/C++ programmable x186 CPU (AMD186ER or RDC R1100) supporting Flash, SRAM, timer/counters, 20+ PIOs ADC, and DAC. Up to 16- chaneels of true bipolar, simultaneous sampling ADCs(AD7606, 16-bit or AD7607, 14-bit) can be installed. The ADC accepts +-10V or +-5V true bipolar analog signals while sampling at throughput rates up to 200 kSPS. Each analog input contains clamp protection tolerant up to +-16.5V. Four channel 16-bit DAC (DAC8544) can output analog voltage(0-5V). A CompactFlash receptacle and a real time clock (RTC72423B) can be installed. Providing a USB 1.1/2.0 slave USB-B port, the USB stack chip (FT232H, FTDI) handles USB stack processing. With USB software driver (D2xx) data transfer rate can go up to 8 MB/sec. User can operate the controller with simple ASCII commands based on TERN ACT firmware. The UB can be USB powered, or powered by external 9-30V DC with on-board regulator. 3.0 x 3.6 inches, USB power or external 9-24V DC power, 200 mA.